...having been in my ownership since brand new. She's been an absolutely cracking little car and I'll be really sorry to see her go. Cue the next three months of my mind going "did I do the right thing?" which always happens. However last time the car moved prior to yesterday when I went to get it cleaned was about eight weeks ago. Prior to that was about a month before that...it's just not been getting used. If I was sensible, I'd just have sold it on the open market. 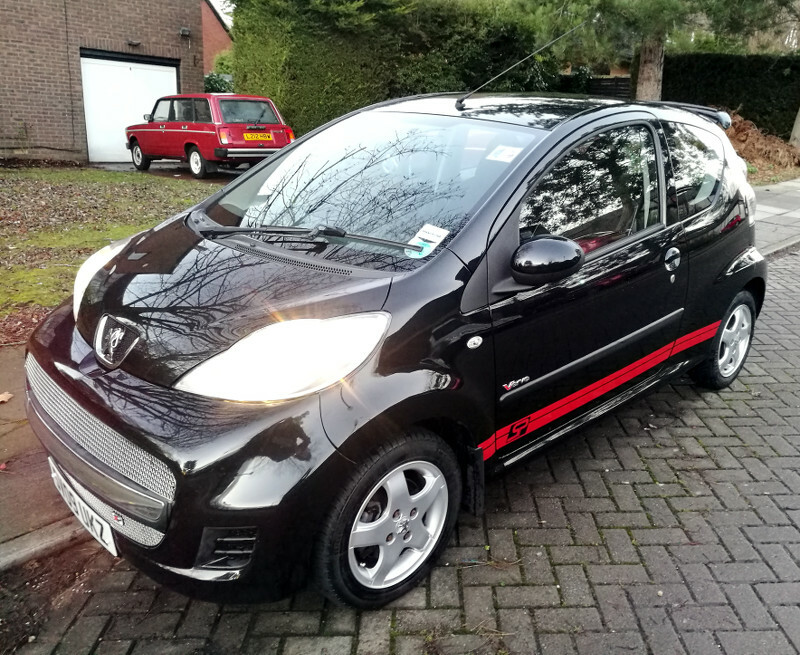 However I'm not sensible - and I despise the faffing around with timewasters that always seems to come from selling cars other than through forums like this - let's not even speak about eBay or Gumtree...So instead I wound up agreeing to do a trade for a project car. While one that needs quite a lot of work done, it's one that's hopefully in the gaining value slowly over time bracket by now - and more importantly - will actually fit in my awkwardly narrow garage while still allowing you to get past it to get to the chest freezer that lives at the back. Yep...It's an Invacar. Well..technically it's not...it's an AC Model 70. Or at least it used to be before it was hacked about to turn it into a tug that was used on a caravan park. 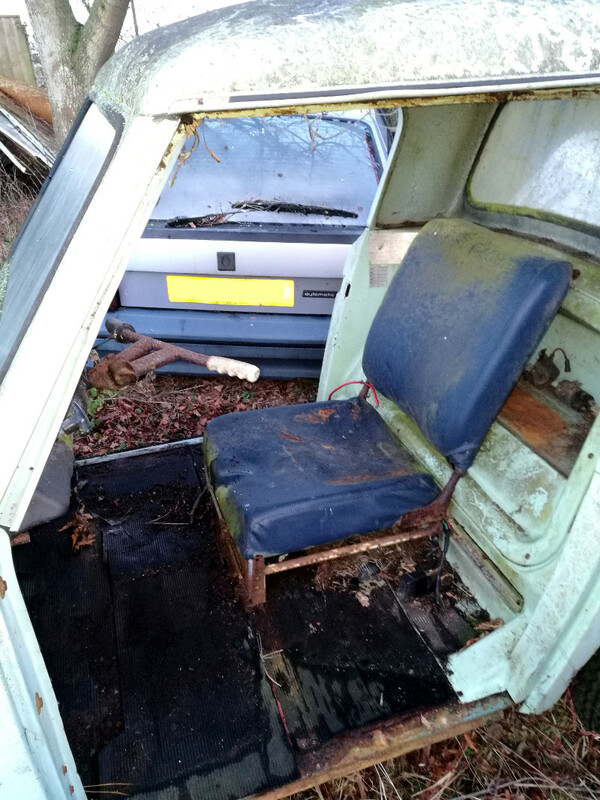 Hence the rear panel having been hacked about to accommodate a tow hitch (removed since the photo was taken), and the entire rear wheel tubs and arches having been sawed off to allow the comically oversized (Daimler!) wheels to be fitted. Of course you can't fail to notice that the entire bloody nose is missing too...We've no idea. Best guess is that it got damaged and they decided just to hack it off to make accessing the front wheel etc easier rather than repair it. Oh...and the wiring loom has been royally butchered in quite a few places as well...so that will need repair. ...showed that much to my astonishment that the chassis is sound as a pound. Nothing that even looks vaguely suspicious and you think might make that sickening "scrunch" sound if poked...just solid. There's a tiny section of one of the front outriggers (which I assume are just crash structure) which has a teeny tiny hole in, but poking it with a screwdriver (well...key) failed to make it any bigger, and even so it's an easy repair even with my limited welding skills. The engine was apparently last running in late 2016, and the vehicle was driving then (albeit without any brakes). So hopefully it shouldn't be too hard to get running. Importantly, aside from the obvious bits of bodywork, it's complete. 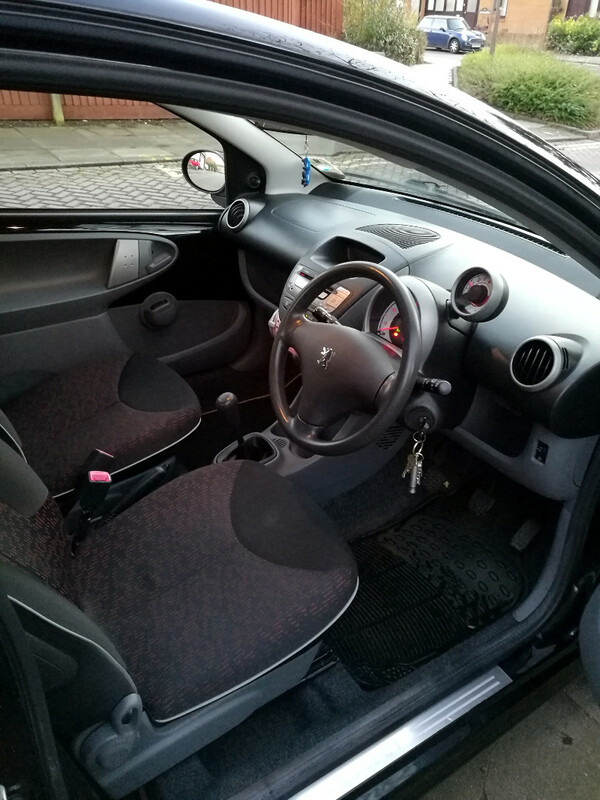 There are quite a few things missing in the photos obviously, but the seller has them safely stashed away, and they will come with the vehicle. Even more importantly, it already has a V5C with it, so I shouldn't have to go through the faffing about with the DVLA. There will apparently be quite a few spares thrown in as well. Get it running...I know this is probably a silly place to start...but let's face it, we've all done it. We want to hear the engine go first. It's also useful to know that bit does work when you're stuck at some impasse later on and want to set fire to it. 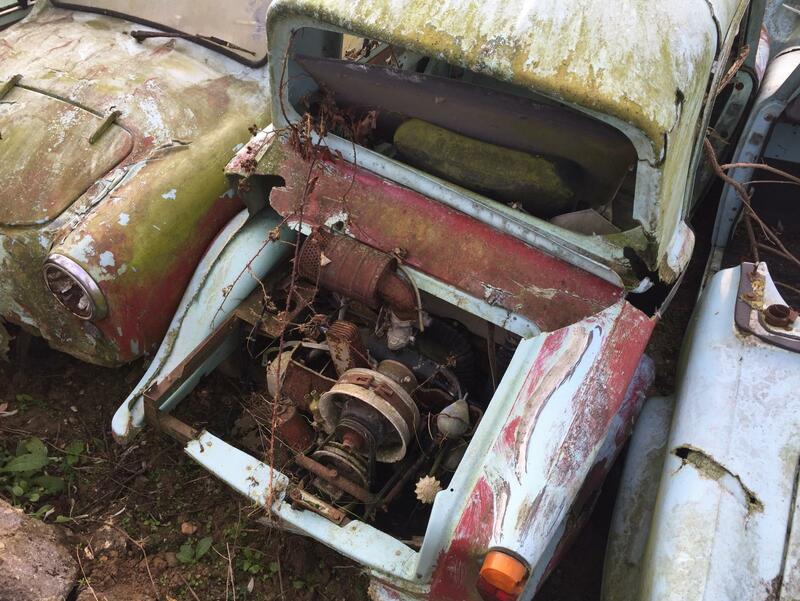 Repair floorpan and any bits of the chassis that look in any way suspect. Rustproof the snot out of it. Rebuild braking system. I figure this will be easier to do with the body separated as access will be a bit easier. Repair damage to rear body and wheel arches. ...Hope that by then I've formulated a proper plan to deal with the front! Current theoretical plan is hopefully to be able to team up with someone who's got a Model 70 with good bodywork and take some moulds from that to allow me to recreate it (probably in several parts). This could also prove handy for other owners who might have smashed corners etc. Either that or find another scruffy front body section somewhere that's repairable and available for me to graft on. 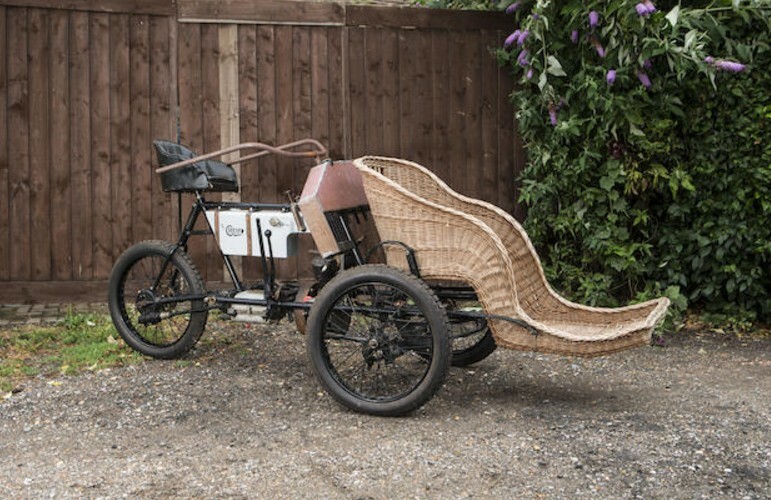 The rear wheel tubs I'm currently thinking will wind up being adapted from Reliant bits most likely unless I'm lucky enough to come across a donor for bits of bodywork - which seems unlikely given that it seems that there are already more rolling chassis around than bodies to go on them. We all know what they say about plans though - they never survive first contact with the enemy. Whatever route I take to getting it done, it should definitely be interesting! A big shout out to Dollywobbler for bringing these little cars to my attention. Until his thread on the duo he's got hold of I'd never heard of them. I decided on sight of that that I really wanted one, so started poking around a bit, expecting to maybe find one in a year or two...stumbling over a viable project less than an hour from home this quickly was at the very least unexpected. There was no wish to seem like a copy cat or to steal any of his thunder - this just happened to work out in a way where things fell into place rather more effectively than I'd expected. Expect a shedload more photos when it's delivered, hopefully at some point this week or next. Now off to resume frantically trying to clear space for it in the garage. I know I've got enough actual square footage there now - just need to play Tetris with the remaining content so I can actually fit the vehicle in it! We need a "complete and utter hatstand, out of their tree, nutter - I like it" button. I can see a thriller-based film coming out of this. Yp - the hotwheels/teenage/wall-poster part of me would love to see those wheels remain - proper 70's ladder bar stance. Full props to taking this one though - any leads for a new nose piece or are you waiting offering DW happy endings for the next decade? Haven't really started digging for bits yet. That's step two. The rear wheels, while looking suitably mental (and I do reckon it would look ace with the arches extended to match) need to go for two reasons. Firstly that they will make getting past the thing in my garage a nightmare - the fact that these are so narrow is one of the reasons I've been attracted to them. Secondly is that they're not directly fitted to the hubs - they've been welded onto the original wheel rims underneath. Fine for dragging stuff about in a yard - but I rather doubt the precision with which they're centred for use at anything north of 10mph, and I don't like the idea of dealing with losing a wheel in something that already only has three. It's one of those cases where I honestly think it looks a lot worse than it really is. It's structurally sound, has been running relatively recently and aside from the obvious GRP bits is pretty much all there. It just looks like something out of Mad Max. Body wise, I've not discounted the idea of (at least until something more model appropriate turns up) finding someone breaking a Robin/Rialto and seeing if I can hack it about to fit. Rear arches I reckon that's definitely the plan. I've no illusions of this ever being made into a concourse example - it will bear many scars and visible evidence of hackery, but they're all part of its story - and I like that. It also means I won't feel quite so guilty if I decide to make a couple of modifications to make it easier to live with. While most of its miles will probably be to/from shows - I do fully intend for this to see use for occasional local journeys if/when I manage to bring it back to life. Looks like my new fan motor is indeed innocent in my current uncontrollable blower speed issue in the Activa. 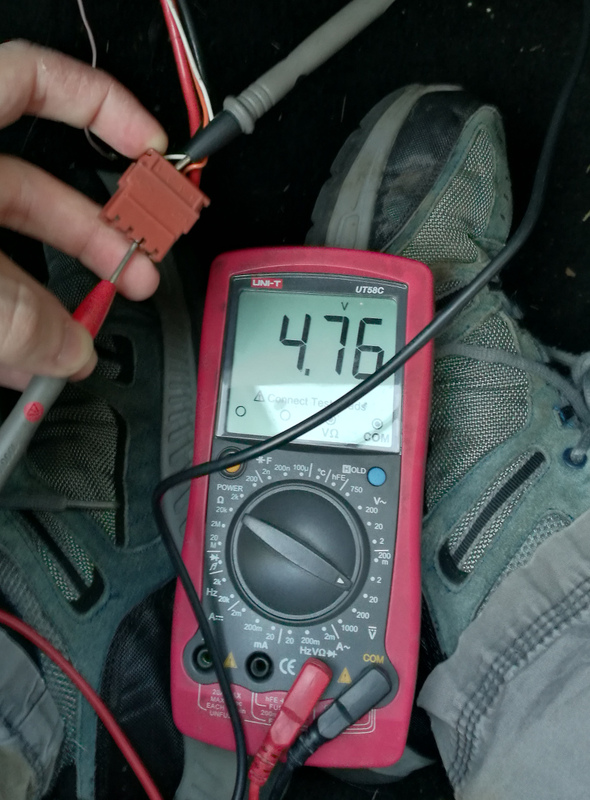 Got the meter out today, and the control voltage is sitting stubbornly at 4.76V irrespective of what the fan speed control is set to. 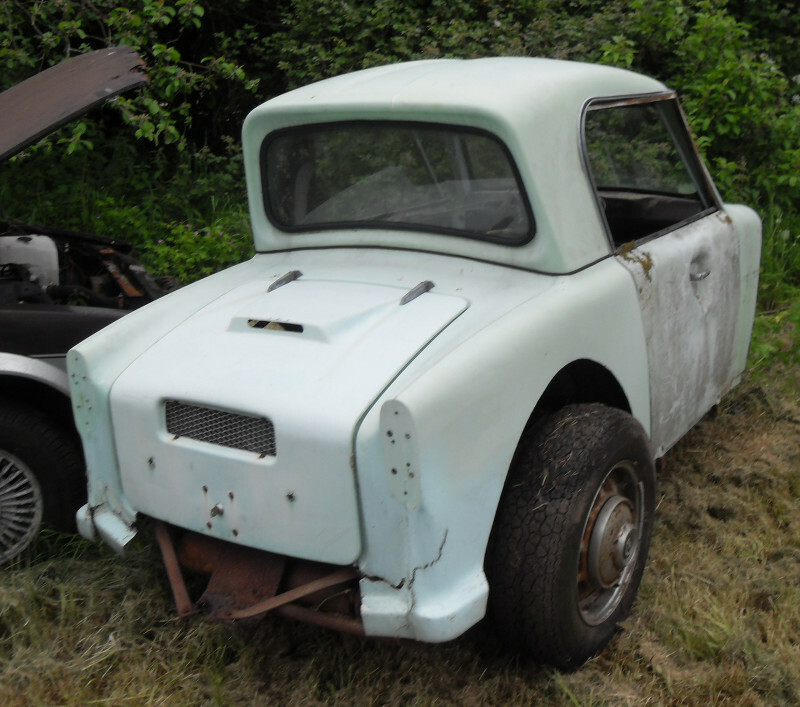 Joe Mason was selling Reliant shells for £1 a few years back. He might let you have one? Got to be worth asking! Don't really have room for a whole shell really, but having said that it wouldn't take long to break up into manageable chunks. Rear wheel tubs are probably going to be first on the list, as that will help a lot in getting a bit of rigidity back into the rear shell. The wheel arch sections should be easy enough to create molds for if DW will allow; polish and wax his one to within an inch of its life, daub mold release over the rear arches then follow it with gelcoat and several layers of resin and cloth. Pretty much my thinking in terms of how to do it, though I'm missing the whole wheel tubs, not just the arches. So probably going to aim to sort that first, then come back to worry about the outer arches. Rialtos and later Robins both used 12" wheels didn't they, so the profile would be in the right ballpark. I think it was just Robin's that had 12 inch wheels. As the tubs are non-cosmetic molds could always be mocked up using cardboard and polyfilla; access on DW's isn't likely to be good enough to do anything other than take pictures and measurements from. Yeah, not too worried about moulds etc for the tubs. Hacking something from a Reliant about to fit seems the way to go there. 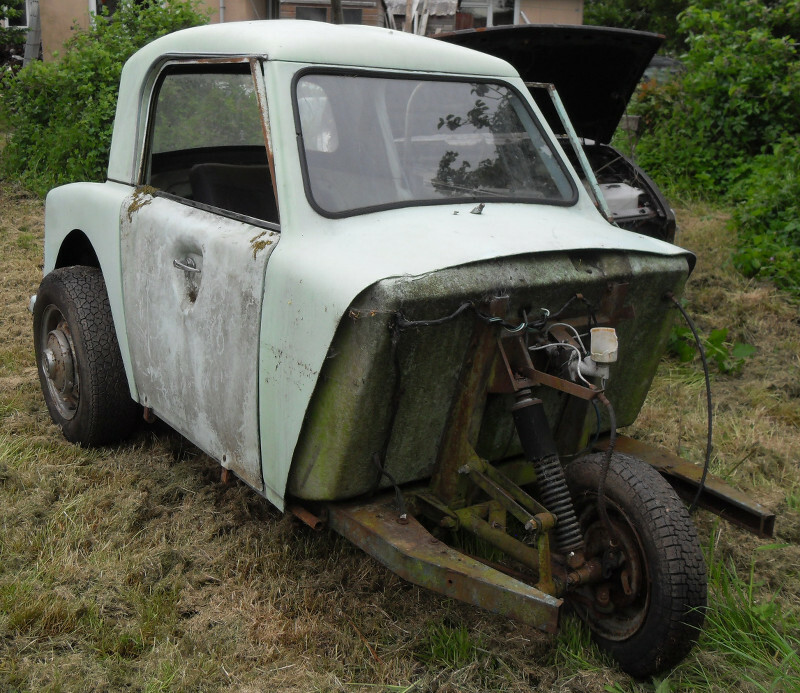 Access to get a mould is just not going to happen unless the body is off the chassis. The body on mine really isn't suitable for moulds, as the paint is absolutely terrible. There's simply nothing to wax. The spares car is in a right state, but may already have been claimed too. It's a sad fact that there are more chassis out there than bodies, so don't rule out the idea of doing something daft with it. I suspect a Reliant body will be too heavy and wide though. They're full of interesting engineering though, so I look forward to seeing how you get on with it. I know there are a few folks out there who have these, so finding one with a good body to get a mould from isn't necessarily a problem. 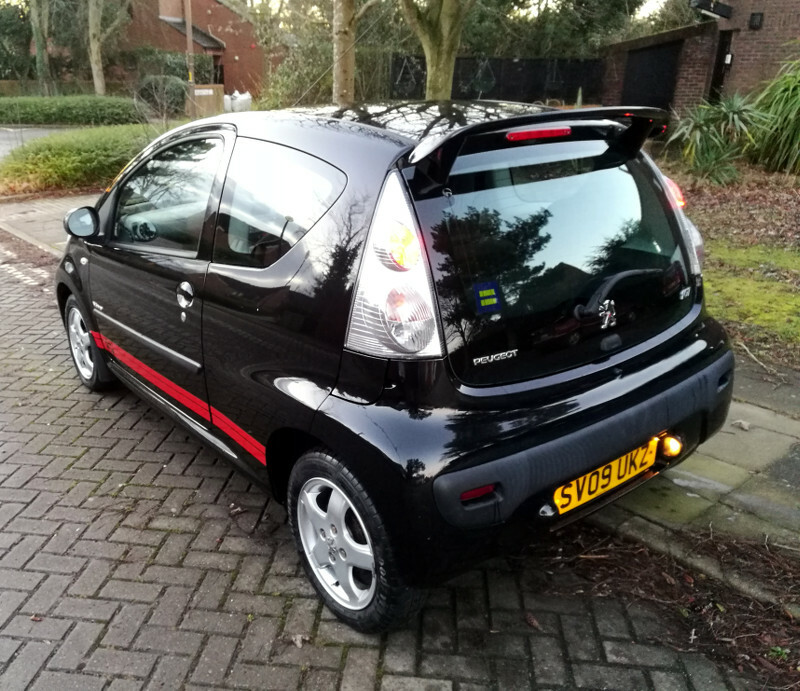 The seller (who's helpfully closer to home) also has a few there of older models, so it's not impossible that I could use one of those - To be honest I'm not really worried about having absolutely period correct wheel arches. It's actually a real shame that this has been hacked about, as it's otherwise in bloody good condition. No cracks/chips in a lot of the usual places, and it doesn't look to have ever been painted. 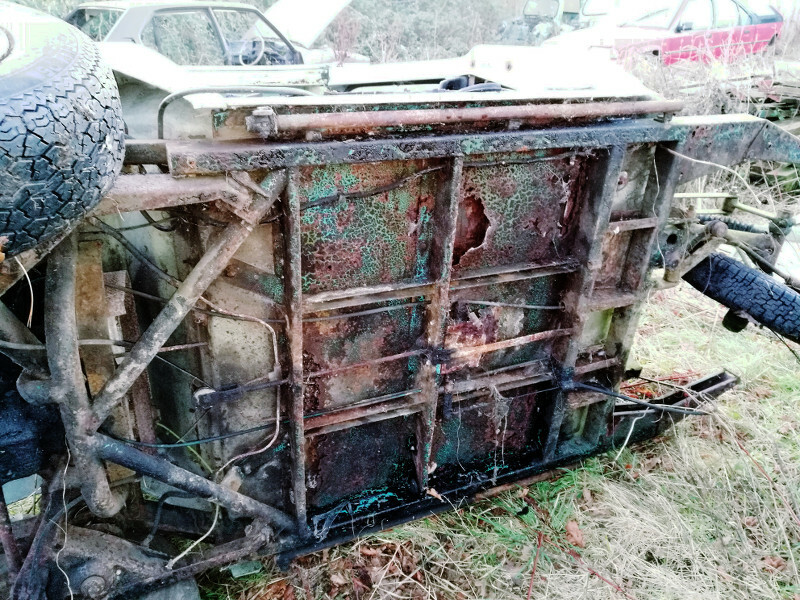 Given that the spares car you've got looks to be restorable body-wise I'd feel bad ripping it to bits - especially given the aforementioned comment about chassis vs bodies numbers. If I'm going to cannibalise a body to restore mine I'd really rather it be one that's beyond redemption. As mentioned though, even a really smashed up front end is a better starting point than I've got so far. I think if nothing else turns up I'll probably look at starting out with a Reliant nose, then chop a section out the middle to bring the width down to sensible levels, then piece it together. It'll probably look awful but should serve its purpose until I come up with a better solution. I'll be leaving the distributor well alone! I know the engine has run with the timing set where it is relatively recently, so potentially fiddling with it will be waaaaay down the to do list - after it's been soaked in Plusgas for about a year. Or five. Your fairy godmother here! Maybe? I’m sure we can do something to help but you’ve got to keep it real.... No need to be so purist that it ties you in knots but the little blue beasties should be just that, no turbos, no comedy makeovers and no other front ends would be my advice..... but at the end of the day it’s your property or are you just its custodian for a while of one of the most historic of vehicles....? That's quite useful to see in itself as it shows me how they were originally contoured - looks like they cut away directly above that outer curve when they hacked my rear body away - which in itself actually might make smoothly integrating the replacement glass fibre easier. Mechanically it'll not be having anything stupid done. I might go as far as electronic ignition and things like that which simply make it easier to live with. Will probably sling a stereo of some description under the dash too so I don't die of boredom when I get stuck in the inevitable traffic jams around here. Any non-stock looking front end will purely be in the interests of getting the car actually working. 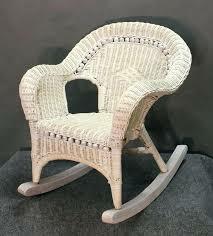 If at a future date I manage to come across something usable to restore it to looking as the factory intended, that will be used. I'm trying to be realistic though, and especially in the early days it may well be a case of "using what I can get" to get it on the road initially. I suspect this car may see several facelifts! Out of interest, the tube with the alloy cap on it immediately in front of the white cap (which I assume is the oil filler), what is that? Crankcase breather? Just slightly concerned if so at how much gunk (and water...) may have got into the engine on mine over time if that's been missing for a number of years as appears to be the case. I wonder what they were using the model 70 to tow? Z said it was being used as a caravan shunter, a sort of DIY miniature Scammell Scarab. From what I've been told it was being used as a tug to shuffle stuff around on a caravan park. My assumption is crankcase breather. Do you have a copy of the manual? I have a PDF. Haven't come across a manual as yet (though several bits of documentation are coming with the vehicle apparently). A PDF copy would definitely be a useful thing to have around. Drop me a PM with your email. First time I've seen the choke referred to in a carb diagram referred to as the "strangler" in a long time! Does indeed appear that my engine is currently missing its PCV valve/cap. Hopefully it's in a box somewhere - even more hopefully the sump isn't full of water or have (or has had) anything living in it...If the worst came to the worst and engine replacement is probably one of the easier things to source...but I'd rather not have to faff about with that nonsense. Find a Haflinger lump for extra LOLs. Or wait for folk to 'hilariously' suggest you fit a motorbike engine. No bike engines going in here..Not my style! I'll get it going one way or another, the engine cover has generally been in place, so hopefully it's escaped too much trouble. Will just have to wait and see I guess. Rebuild this with miniature Scammell bodywork. A sort of 1/3 scale scarab.